Court clerks walk the picket line at the Hall of Justice in San Jose. A possible solution to the Santa Clara County Superior Court employees strike is in the works. The Superior Court Professional Employees Association confirmed on Wednesday its negotiation team has agreed to work toward mediation with court management. 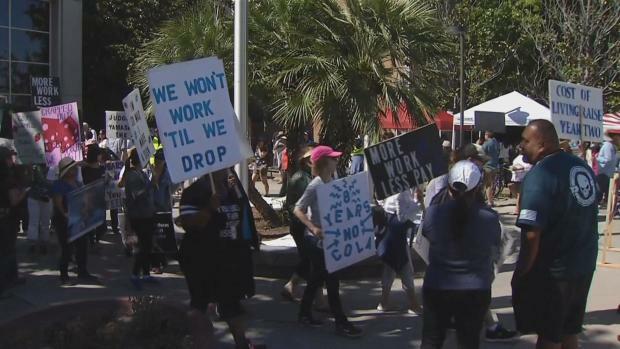 NBC Bay Area reported exclusively Monday management had suggested third-party mediation to settle the strike over wages and staffing, which began one week ago. The union told NBC Bay Area it agreed to help pick a mediator but only if there were an indication and belief it could achieve the goal of a pay raise in the second year of the proposed contract. On Monday, the clerk's offices were shut down, as were many of the courtrooms, continuing to delay cases and testing the patience of those who do business at the courthouse. Robert Handa reports. County management has offered basically a 9.5-percent raise with what it called a 15 percent gross raise over two years. NBC Bay Area has reported on numerous delays in all court business including slowdown in traffic court and inmates not being transported to court dates. Union officials say the work shutdown will continue until the contract situation is resolved.